“I came so close so many times and it just didn’t happen. I didn’t think it was ever going to happen…” Patti Bailey quietly spoke to a gathering of family and life-long friends during her evening home dedication in February 2019. Patti is a little shy, but has an easy smile and a warmth that makes her instantly likeable. The people gathered for the ceremony have been in her life for decades, including two friends from high school who shared tear-filled words about how deserving of this home she is and how much they love her. It’s all a testament to the literal and figurative foundations of Patti Bailey’s home. Patti’s mother, Mary, lives in the house next door to this new modular home that rests on the side of a wooded mountain deep in Graham County. You wouldn’t find either house if you weren’t looking for them, and even if you are, that’s no guarantee you’ll get there very easily. This land has been in Patti’s family far longer than her loving friends have been in her life. The place where the beautiful new Habitat home sits used to be occupied by a single-wide trailer that Mary’s family had lived in before they built the wooden house nearby. Mary explained that the trailer had been full of her late husband’s things: “He was a collector. He brought home all kinds of stuff.” When Habitat NC started looking for a place to put Patti’s new home, Mary agreed to let the trailer, and the memories within it, go. She knew that the land could be put to better use helping Patti make new memories on those old foundations. Patti Bailey (right) and her daughter Trinity receive the keys to their new home. This house in Robbinsville, NC, is part of a partnership between the SECU Foundation and Habitat for Humanity of North Carolina to build or renovate a Habitat home in each of North Carolina’s 100 counties. When a Habitat affiliate closes on a home, SECU then buys the zero-interest mortgage from them so that the money is immediately available to start work on a new house. 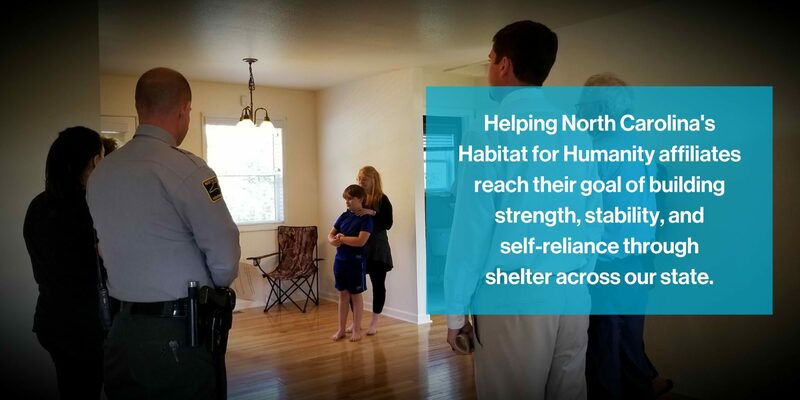 Patti’s home is one of 17 that Habitat NC has personally undertaken in counties that are currently unserved or underserved by their own affiliate. The house will start a new chapter for this family, as Patti and her three daughters have been sharing Mary’s house for three years. Two of her daughters will move into the new house with Patti, and her middle daughter will stay next door, keeping her grandmother company. Her family will stay close-knit and close-by, and this mountain, which has seen so much of their history, will continue to bear witness to it. The foundations here are strong, just like the women who have built their lives on them. And now, with a Habitat house around them, Patti and her girls can face their future with the security of safe, affordable housing. Patti Bailey (left) and her youngest daughter Trinity, with Cubbie the dog, in front of their new home in Graham County.